Economic growth has been driven by domestic demand. Beside strong investment growth also household consumption expanded more rapidly than the GDP. In trade of goods the expansion of imports exceeded to a large extent that of the exports. 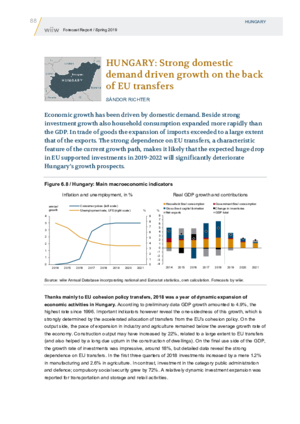 The strong dependence on EU transfers, a characteristic feature of the current growth path, makes it likely that the expected huge drop in EU supported investments in 2019-2022 will significantly deteriorate Hungary’s growth prospects.